The seedling stage is the most critical phase in the life of a corn plant. 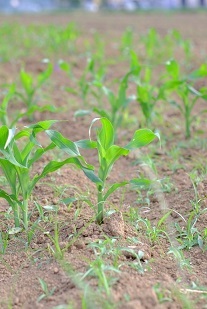 Corn seedlings need 110-120 growing degrees to emerge out of the ground. The seedlings emerge when coleoptile, the spear-like leaf, pierces through the ground. First and second leaves develop six to seven days after the seedlings emerge. The first roots start to supply water and nutrients to the young seedlings. Roots are very small; banded fertilizer close to the roots at this stage should be very helpful in stimulating early growth. About two weeks after emergence, third leaf starts to develop. Seedling roots stop at this stage and the secondary roots known as “nodal roots” start growing. These become the permanent root system of the plant. Make sure that weeds are in control at this stage; even small weeds can affect yield by light reflectance from their chlorophyll. The growing point stays below ground for three to four weeks and is protected from frost or insects on the surface. Cultivating too close to the plants after this stage may cause root damage; hail storm or freeze at this stage may hurt the leaves but the growing point is not damaged since it is still below the ground. Avoid thinking about replanting at this stage— the nodal roots are growing fast and start taking over the responsibility of gathering water and nutrients for the whole plant. Root hairs also start growing at this stage. Four nodes develop below the ground. The first node above the ground is generally the fifth node. Even at this early stage of growth, leaf and ear shoots start to develop. At seedling emergence, young plants face many hurdles such as nutrient deficiencies, seedling diseases like Pythium and Stewart’s bacterial blight, slugs and insects like black cutworms. Corn rootworm beetles larvae attack the roots during June and early July and the adult beetles clip the silks and may interfere in the pollination process during July and early August. Farmers should particularly watch for these bugs if using GMO corn where the trait has failed or non-GMO corn without insecticide. Also watch out for slimy little slugs which appear harmless but can cause considerable damage, especially in low-lying areas. Be sure to side-dress with nitrogen before the plants are too tall, if there is a desire to apply additional nitrogen. Be sure to check for deficiency of nutrients like phosphorus, sulfur, zinc and magnesium. Early stand establishment is essential for high yields! For more information, contact Dave Nanda, SGD director of genetics, at dnanda@seedgeneticsdirect.com.